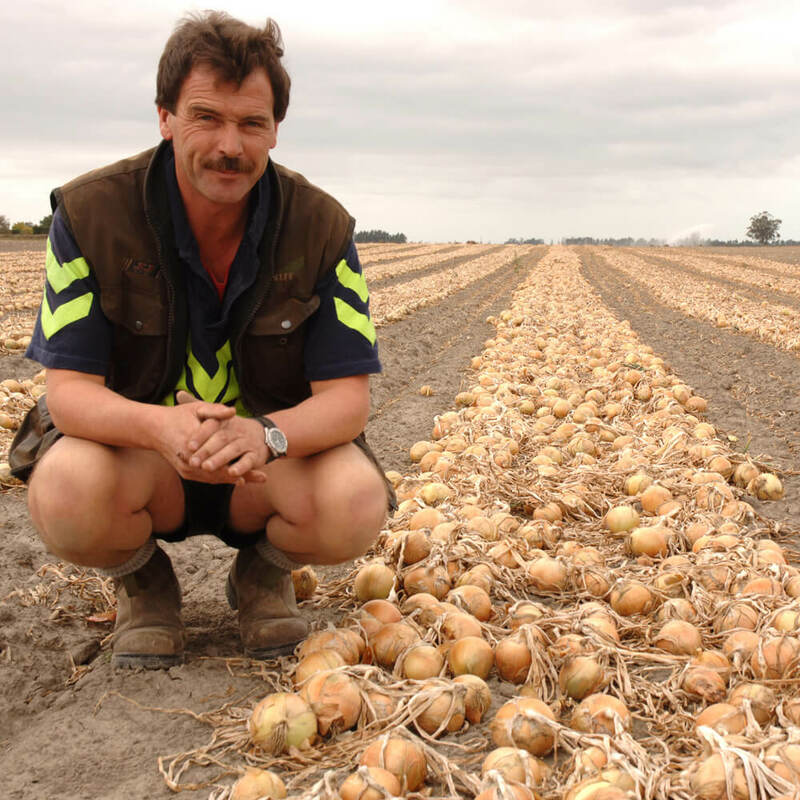 Onions are New Zealand’s top fresh export vegetable in value, accounting for around $100M per annum. We grow for local and export markets, including Netherlands, Germany, Sweden, France, Indonesia, Malaysia, Singapore, Taiwan, Japan, Hong Kong, and more. Varieties are intermediate day length types including ELK (Early Long Keepers), Perez, Canterbury, Goblin, Rhinestone, and Tilbury. Land preparation starts years before we plant onions, with a rotation of crops and green manure. Planting starts in March with our wintering types and July as the day lengths start to increase.Cover crops are a major component in keeping our onions safe from getting sand blasted in the spring from the strong winds we can experience. We plant cereals or grass with our onions to provide shelter while we are planting and should finish planting onions early September. Constant monitoring and inspecting during the growing season is crucial to get the bulbs able to yield and store. Harvest starts in December with our wintering onions for the local market, and going through until the main season storage varieties in February and finishing in April. We harvest with Top Air machinery out of America, into bulk trucks that take the onions back to the Packhouse where they are binned off ready to be graded, packed or stored for later orders. Our Packhouse provides different solutions to different customer’s needs, from onion bulb sizes ranging from 35mm – 90+mm and packing sizes from 5kg-1.4T bags. An automatic bagging and stacking machine makes light work of the many stacks that need to be produced every day. Onions are stored so we can supply 12 months of the year, but our export program finishes around July as the Northern Hemisphere harvest starts to supply the markets.